During the week of May 6, 2019 the Department of Elementary and Secondary Education’s Office of Public School Monitoring (PSM) will conduct a Tiered Focused Monitoring Review of special education and civil rights at our school. 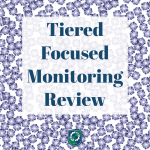 The Office of Public School Monitoring visits each district every three years to monitor compliance with special education and civil rights federal and state regulations. Areas of review related to special education include student assessments, determination of eligibility, the Individualized Education Program (IEP) Team process, and IEP development and implementation. In addition to the onsite visit, parent outreach is an important part of the review process. The review chairperson from the Office of Public School Monitoring will send all parents of students with disabilities an online survey that focuses on key areas of their child’s special education program. Survey results will contribute to the development of a report. During the onsite review, the Office of Public School Monitoring will interview the chairperson(s) of the district’s Special Education Parent Advisory Council (SEPAC). Other onsite activities may include interviews of district staff and administrators, reviews of student records, and onsite observations. Parents and other individuals may call Moses Nduati, Public School Monitoring Chairperson, at (781) 338- 3707 to request a telephone interview. If an individual requires an accommodation, such as translation, to participate in an interview, the Department will make the necessary arrangements. Within approximately 60 business days after the onsite visit, the review chairperson will provide our school with a report with information about areas in which the district meets or exceeds regulatory requirements and areas in which the district requires assistance to correct or improve practices. The public will be able to access the report at www.doe.mass.edu/pqa/review/cpr/reports/.